Closed but promising, this is a classic Cos revealing lots of tannin along with damp earth, black currant, sweet black cherry, graphite, licorice and truffle characteristics. This medium to full-bodied, structured, firm, broodingly backward, impenetrable effort demands 5-6 years of bottle age; it should drink well for 20-25 years. Drink 2016-2036. 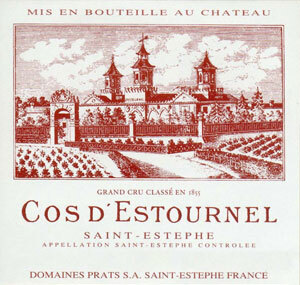 The 2008 Cos d'Estournel possesses an atypically high (85%) amount of Cabernet Sauvignon, with 13% Merlot and 2% Cabernet Franc. The first vintage vinified in the new facility, an unusually high percentage of the crop (78%) was included in the grand vin. The bad news is that yields were a minuscule 25 hectoliters per hectare. This wine achieved 13.8% natural alcohol, and the number of days between the flowering and harvest was 160, compared to the normal 100-110 (one of the keys to understanding the exceptionally high quality that characterizes the 2008 Bordeaux). There were no serious heat waves during the growing season, which meant that the maturation process was slow, long, and ideal. Combine that with the very low yields, and the superb weather from mid-September to late-October, and the often splendid results are much easier to comprehend. The inky/purple-hued 2008 Cos is still very young, and probably will improve even further as the wine came out of malolactic fermentation very late. It reveals exceptionally precise, fresh aromas of black fruits, crushed rocks, licorice, flowers, and subtle smoke. Dense and high in tannin, the extraordinary richness of polyphenols has given the wine power, substance, and depth, but the sweetness of the tannin and the seemingly low acidity, even though the wine tastes remarkably fresh and the pH is only 3.57 (compared to pH's close to 4 when the fruit is this ripe), has given the wine a precision and elegance that is remarkable. And don't forget, this is probably the highest percentage of Cabernet Sauvignon ever used in a Cos d'Estournel blend. This wine should gain weight, richness, and a few Parker points by the time it is bottled. It is even denser and richer than the 1996, with an index of polyphenols at 80, which is not unusual for many of the top wines of the vintage, but is extremely high, and more along the lines of what one would find in the top wines of 2005. It should evolve for 30-35 years.This property has undergone a complete make-over, building a state-of-the-art, spaceship-looking new winemaking facility, and giving brilliant winemaker Jean-Guillaume Prats carte blanche authority from proprietor Michel Reybier. The team continues to fine tune and reflect on every possible detail in both the vineyard and the winery in order to achieve even greater success. Tasted ex-château and single blind in Southwold. This bottle of Cos d'Estournel 2008 is not as scintillating as the one tasted at the property, but it remains a great performer. Compared to its peers it is more forward on the nose: quite meaty and savoury, some expressive, slightly herbaceous Cabernet Franc here that I have not noticed previously. The palate is medium-bodied with good extraction: fleshy and supple in the mouth, a lot of creamy new oak and perhaps just lacking the mineralité on the finish that I discerned on other bottles. Very fine indeed although it will improve with bottle age. Tasted January 2012. It has all the concentrated power that one might expect. The palate has the complexity of different black fruit flavours, first rich damson then lighter bilberry and bramble. There are tannins in evidence but their ripeness adds more flesh than structure, Hints of bright redder fruits emerge giving a more flowing elegance.